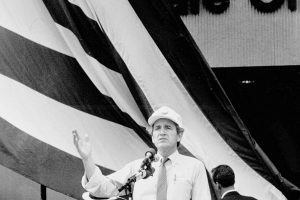 Iowa Sen. Tom Harkin rallies at the W. Dale Clark Library in Omaha on Sept. 15, 1986. Each month, the Omaha Public Library will introduce you to one of its 12 locations. Follow along to learn something new about the library and discover its role in the history of Omaha. Learn more about the library you love and uncover some hidden treasures at others. To learn more about W. Dale Clark Library, schedule a visit or plan to attend the monthly library board of trustees meeting at 4 p.m. on Wednesday. The meeting is open to the public to voice questions and comments.